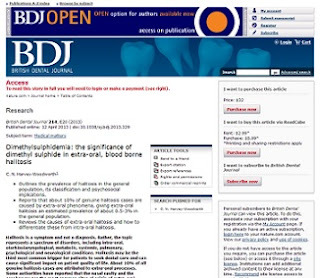 The abstract of a review paper compiled by MEBO Research, Dimethylsulfidemia: the significance of dimethyl sulfide in extra-oral, blood borne halitosis, was published in the British Dental Journal on April 12, 2013, noting MEBO Research, Inc., as one of the sources. Dimethylsulphidemia: the significance of dimethyl sulphide in extra-oral, blood borne halitosis. ...recent evidence appears to suggest that blood borne halitosis may be the most common subtype of extra-oral halitosis. Tangerman and Winkel report that dimethyl sulphide was the main volatile implicated in extra-oral blood borne halitosis. They proposed a hitherto unknown metabolic condition by way of explanation for this finding, resulting in systemic presence of dimethyl sulphide in blood and alveolar breath. This paper reviews the knowledge base regarding the behaviour of dimethyl sulphide in physiological systems and those disorders in which blood borne halitosis secondary to dimethylsulphidemia is thought to have an aetiopathological role. Tangerman and Winkel have stated they are currently researching this new condition in their recent papers, and at some point it is likely they will publish more about it. The term 'dimethylsulfidemia' (DMS) is not meant to stand as a name for a new metabolic condition, as there are several other possible causes of elevated blood DMS. We leave the naming of the metabolic condition (if it turns out their findings are correct) to those that discovered it. So far, Drs. Tangerman and Winkel have described it as “the condition under study” only, and have not given it an official name. Hi .......im ecited to see all the new research in the bog.......Does this just mean mouth odors. Or does this mean systemic body odor that comes out when we exhale breath? Or both? I read something about it being produced by bacterial metabolism????? Some scientists refer to intra-oral odor as oral odor or tongue odor, including gingivitis, saliva, dead bacterial cells, anaerobic bacteria in the dorsal tongue producing volatile odorous chemicals, and food, for example. Other scientists may also include paranasal odor or nasal odor, including rhinosinusitis, post nasal drip, allergic reactions, tonsilloliths, tonsillitis, post-nasal infections, etc. Another source of odor that is discussed in literature is gastroesophageal odor produced by GERD. Erosive changes in the esophageal mucosa have been associated with volatile sulfur compounds in the mouth. Yes, it is very heartening to know that research projects around the world are on their way. It’s just a matter of time before we begin to get some more answers. According to Wikipedia’s definition, "Microbial metabolism is the means by which a microbe obtains the energy and nutrients (e.g. carbon) it needs to live and reproduce. Microbes use many different types of metabolic strategies and species can often be differentiated from each other based on metabolic characteristics. The specific metabolic properties of a microbe are the major factors in determining that microbe’s ecological niche, and often allow for that microbe to be useful in industrial processes or responsible for biogeochemical cycles." The best way I understand this is by using very rough layman’s terms, the microbes (bacteria is only one type of microorganism) feeds on something (usually foods – protein and amino acids, for example) and “excrete” odorous catabolytes. Like us humans, they eat their preferred “food type” and excrete waste. Very roughly speaking, that process that produces change is metabolism. Thank you I understand it now the way you explained it. Hopefully they gain more answers soon. Secondly what diseases can they be as i have chronic halitosis and all doctors give me a clean bill of health. I have used oxygenating tooth paste but they don't stop the odor can activated carbon help. I think, I could be wrong though, its sulfur foods high in thiols that are a problem or foods the body can turn into thiols. not just sulfur foods......thiols is connected with sulfur..I forget this is something I'm reading about online.....I think some foods labelled high in sulfur are fine to eat because they contain no thiols..????? This implies that since the condition is still under study, there are no diagnostic tests in place for a condition that has still not been determined or defined, as it is still the subject of research. If there is no condition to be diagnosed, there is no prescribed protocol to treat it, there is no diet prescribed, and no recommendation of what foods one can and cannot be consumed. 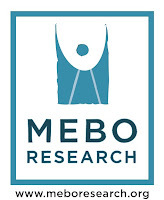 The MEBO Research Blog is an attempt to bring sufferers and experts together to promote research. It is a place where sufferers actively look for published papers and compile them in this blog for educational purposes and to facilitate and promote research. Please, make sure that information is kept within intended context so as not to mislead sufferers into developing unfounded protocols. "its sulfur foods high in thiols that are a problem or foods the body can turn into thiols. not just sulfur foods......thiols is connected with sulfur.."
This is interesting information. I'm sure the readers of this blog would be very interested in seeing links to the source of your information. Thanks for your input. Livingnetwork.co.za is a website that prompted me to research further free thiol sulfur food intolerance...please remember I am still seeking more credible sources......this may not be a cerdible source, just a base for me to research further, I work long hours, I will post a credible link when I find it. My tablet made a capital L use lowercase l for living network. I also don't know if free thiols in sulfur foods are associated with body odor or just mercury toxic people or both. 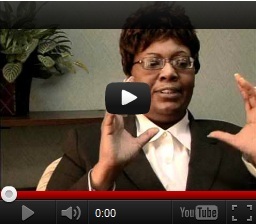 Like Maria has told us scientists and researchers are still trying to figure this all out. Maybe thiols have nothing to do with body odor bu all sulfur foods do???????? This was of interest to me. We can read online eggs can cause body odor in the general public,we are seeking sources for odors beyond what the general public experience...www.livingnetwork.co.za ws a start for me to research further...it raised interest for me. Try typing high sulfur food list followed by livingnetwork.co.za. it is an article not an advertisement and lists foods high and low of thiols.....I don't post links because I'm terrible with computers. High free sulfur also called thiols is often a problem for sulfur intolerant people. Meatvis very highbin sulfur BUT it is bound sulfur and rarely ever causes a problem..........I don't know if therevis a body odor connection or not...why sulfurcfoodsvmay cause abnormal body odors..........we know eggs andcgarlic can make the general public smell, we seek causes for ABNORMAL body odors and seemingly uncontrollable, and if food consumption plays a role. Type link. Www.ibsgroup.org/forums/topic/158680-low-sulfur-diet. We need to remember sulfur is important to health, cutting all sulfur foods out of your diet is not recommended without speaking to a doctor..the goal would be to consume less not stop consuming all sulfur foods...we don't know enough...sulfur is not that simple to understand.....my tablet is difficult to type with and often extra letters are typed in where the don't belong. These two articles talk about how thiols themselves have very strong pungentvodors and as levels change the odor grows stronger..it can often smell like garlic. Www.wisegeek.co/what-is-coenzym-a What is coenzym A speaks about how thiols are odorous so possibly it may be sulfurfoods high in thiols that cause odor and not all sulfur containing foods???????????? I wish the scientist will find the solution to this problem as I suffer from chronicle halitosis and have been using oxygenating mouth wash and tooth paste which don't seem to neutralise the odour. I have also tried going to airy places like the forest and beach in hope that the smell wiull be diluted but air does not neutralise it it just spreads and spreads. Thus I believe oxygenating is not the solution for my problem it needs more energy which can help break the thiol bonds or the bacterias feeding on it maybe enzymes or strong reducing substances might help. Please help us solve this life distorting problem. As the comment dated 16 April states, “sulfur is important to health, cutting all sulfur foods out of your diet is not recommended without speaking to a doctor…the goal would be to consume less not stop consuming all sulfur foods…” I understand complete restriction of essential sulfur containing amino acids such as methionine can be very unhealthy http://link.springer.com/article/10.1007%2Fs10620-007-9900-7. I think that the only option we are left with is to resort to common sense concepts that society at large is pretty much aware of. I think it’s commonly understood that if most people eat a raw onion and raw garlic, their breath will reek for some time. These are foods high in sulfur. Sulfur is very volatile, and that’s why it smells, and that’s why cutting an onion can make your eyes tear. The best way to help remove at least some of the odorous sulfur from onions and garlic is to sauté them in olive oil, allowing the smell to go “up in smoke” and then add only a small amount to your meal. A degree of both blood borne halitosis/body odor (extra oral halitosis) and intra-oral halitosis (oral malodor) following consumption of volatile foodstuffs can be considered normal. Sudden "attacks" of odor I believe are typical of blood borne malodor conditions generally, and probably represents short term sympathetic responses, up-regulating sweating, respiratory rate, heart rate etc. when under stress, anxious etc. I think it’s a good rule of thumb to smell your foods before eating them. If your food has a strong scent and you ingest it, that strong scent just went into your body at that moment. Yes, there are digestive juices and digestive enzymes to break them down, but then it goes to your gut, and some microbes might produce even more odorous chemicals from the food, which then goes to the liver through your bloodstream for metabolism of the odorous chemicals. Some very fortunate people in this world have great digestive juices and enzymes, a greater amount of non-odor producing gut microorganisms than odor-producing ones, and their metabolic enzymes are the strongest amongst all human beings. But many suffer from less than optimal conditions on all these fronts, and thus, suffer from body/breath odor. Maybe all we can do for now is to at least avoid eating foods with very strong odors, including onions, garlic, peppers, curry, strong cheeses, etc., because they probably contain high levels of sulfur. Eggs too, I find eggs increase odor significantly...but I read egg yolks with the whites washed off will produce less odor, eat the yolk not the white part.....I have not tested that out yet though...I believe diet changes and new research involving gut flora and prebiotics may eliminate odors in a large number of people, so I do hope this happens sooner rather than later...I think new research involving gut microbes will benefit a large number of people. Even if we don't know which microbes cause odor..I'm learning the body only has 3 super beneficial microbes anyway...bifidobacteria like that in align, and loctobaculli strains, and a third that dies instant whenvexposed to oxygen that can never be man made into supplements the only way to have it is to be born with it......I forget the name of it.......and hundreds of others way less beneficil....so maybe an affective bifido and lactobaculli supplement may help........????????? That’s right. Still omnipresent in the discussions in our community is the confusion of which protocol (especially the diet) to follow. Without knowing the cause of each individual’s condition, we find that what could work for one condition is actually detrimental for another condition. For example your understanding of what part of an egg is good may probably apply well for certain conditions. On the other hand, the egg yolk is very high in choline and would produce very strong odor on persons who suffer from TMAU. This is why MEBO is working so hard on a daily basis to promote and initiate much more research. Keep in mind that MEBO has a very low budget, and that some of our projects get done solely on the backs of volunteer workers (sufferers and experts who help us with PowerPoint presentations, interviews, and handouts), who do not receive payment for their services. It is important for sufferers to participate in testing to not only help themselves to better understand and treat their conditions, but to also help provide data to our experts who oversee testing. So often people don’t do the TMAU Test because they believe they don’t have TMAU, yet they haven’t been able to control their odor levels. If the question is to eat egg yolks or not, for example, then a negative TMAU Test result would indicate that, yes, it should be safe, or a positive TMAU Test result would indicate that you should stay away from egg yolks. This would be the case until new research would indicate otherwise. Many sufferers undergo a guessing game without testing, and then wonder why nothing is working. MEBO’s top priority right now is to pursue research (as opposed to only testing) the gut microbiome, and preferably to also include various parts of the body in addition to the gut, including the mouth (for halitosis), skin, and/or groin (for bromhydrosis). It is important that the research project focuses on the needs of idiopathic human malodor conditions of all types (as much as possible). I know that even though I tested negative for tmau, I did my partcto help myself and others in the community too...we need to remember if all researchers think that all people with odor issues have tmau they will never consider other sources of odor, your negative tmau test shows researchers just how many people truly have odor issues....ruling in and out is the only way to move foward...the goal should never be tohelp ME the goal should be to help US.....remember the very same odor producing microbs affecting tmau suffers may be the very same odor producing microbes affecting you, even if you don't have tmau...we may all share common odor producing microbes..finding the microbes responsible for tmau, may find the microbes that produce y odors, even though I tested negative for tmau....we can not get any where if we just try to help ourselves, we have have a common goal, we all need to help each other. I thank everyone for their help. What is the specification of the gas chromatographic device so that people not in Europe can ask their doctors if they can access it for tests. I'm sorry. I really don't know. I'm not an expert. I've been told that halimeter might measure DMS in breath, but it's just hearsay.